The flag drops. Your engine comes to life. All 1300 horsepower of racing machine screams across the starting line, kicking up a monster rooster tail of water. This is the world of superboat racing. 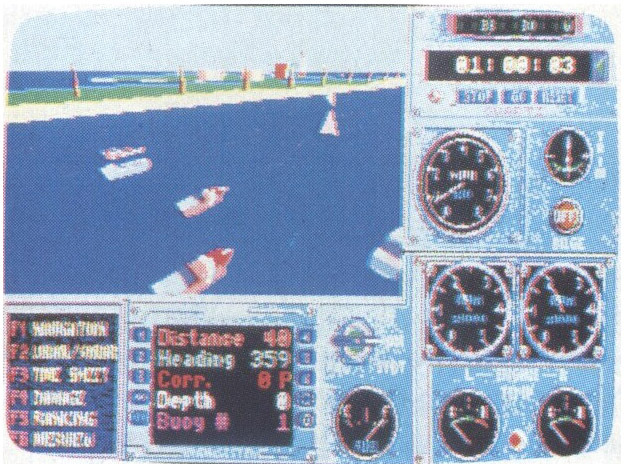 In Heat Wave, you try to capture the crown of superboat racing, the title US-1. Race a season and see how your points stack up against the other racers of the circuit. Six preset courses provide plenty of high-speed challenge, and you can create up to ten different custom courses. Try to handle the power of a superboat. Select your boat from one of four different types. I chose a catamaran because it performs best in calm water and reaches speeds of 100 mph. As a rookie to the racing world, I had to register myself and my boat before I could race. And I made good use of the practice sessions, which are set up just like the real race but don't affect your season standing. After choosing a course, you race the other four computer-controlled competitors. The graphics are superb, and you control the degree of detail. The greater the detail, the slower the game speed. Although I didn't find the game speed to be a problem, occasionally the game didn't respond to my keystrokes. This was quite irritating at the starting flag. Qualifying isn't easy, either. Running full speed to the first buoy of the race and then turning 180 degrees to race full speed back to the starting line turns out to be quite a challenge. At first it's hard enough just keeping track of where you are on the course and where you're going. But once you've developed a little proficiency in basic boat handling, you'll start to notice the impressive array of engine instruments and equipment on board. Pay attention to this equipment to avoid running aground, overheating, overrevving, or running out of fuel. Winning in superboat racing is more than just being the first to cross the finish line. During the course of a race, you can accumulate time penalties, which are added to your finishing time. Missing a buoy or having to repair your boat during the race adds minutes to your time. Heat Wave is a game of excitement and challenge that may give even Don Johnson a run for his money. With some skill and a little luck, you might make it to the winner's circle.